So I’m off to the airport tomorrow for a weeklong vacation. If I wasn’t so harried, I would have packed myself a nice breakfast to take on the plane. I am flying Southwest Airlines on a 4-hour nonstop flight to Chicago and the most I expect is a measly little snack pack. But since I’ll be up at 4 a.m. tomorrow to make a 7 a.m. flight, I picked up some questionable Lunchables Jr. to tide me over. Questionable not because of the apple dip or the graham sticks but of the cold, breaded chicken strips. I’m hoping to balance it out with a banana in case that falls through. More than likely it will. I’ll be back next weekend with photos and tales of adventure from Chicago, Cleveland and somewhere in Michigan. See you in a week! Hey, I just saw your comment – have fun on your trip! I have a few more posts to put up, and there were others that I couldn't get pictures at, because there was such a big group of us. Anyway, I look forward to reading where you eat, so I can plan some new places for when I go back. Have a safe trip and would love to hear what you think of that book – it's been on my list for a while and I just haven't gotten to it – is it worth it? There is something about cold chicken strips or breaded chicken chunks that kids love. My oldest had them for lunch a few times; kids don't care if they are hot or cold. He has also asked for Lunchables since preschool days. He says a lot of his friends eat them. We finally got him 2 for the days we were between the rental home and BOQ. Funny..he hasn't asked for any more since. Hope you have a GREAT trip, Darlene! 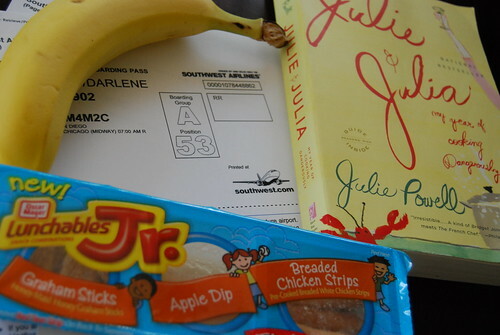 You might be surprised by the goodies that you get on Southwest. I took a 5 hour flight direct to Las Vegas on SW and was expecting peanuts and soda. This trip was in 2003, so it may have changed. But they gave us each a whole box of goodies. All snacky stuff, but a substantial amount!Enjoy your vacation!